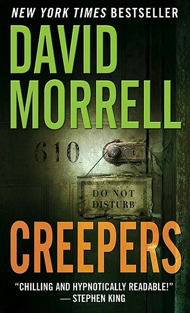 David Morrell's Creepers made it onto my wish list after I had read somewhere that the novel was about urban exploration (I think I discovered Creepers using StumbleUpon, which initially introduced me to the concept of urban exploration). I can't locate the exact article that piqued my interest, but I remember Creepers being mentioned alongside photos of abandoned office buildings that housed old computers with moss and decay growing across the monitors. I was instantly fascinated and intrigued by the idea behind urban exploration, and set out to hunt down a copy of Creepers. "Creepers" is a slang term for urban archaeologists who explore abandoned buildings banned from the public or awaiting demolition. In David Morrell's Creepers, a group of explorers visit an old hotel located in the ghost town of Asbury Park at Jersey Shore. The hotel was designed by a paranoid and seemingly sadistic agoraphobic millionaire, so you can imagine the type of booby traps the group of creepers encounter as they explore the hotel. The creepers are accompanied by reporter Frank Balenger, who has plans to honor the urban explorers anonymously in the New York Times, considering the act of urban exploration is mostly illegal. But, little does this group of creepers know that they'll discover much more than just timeless artifacts from the turn of the century. Oh, the horror! Creepers is absolutely gripping, horrifying, and incredibly fast-paced. Morrell is an amazing storyteller, and unfolds the mystery of the story quite gracefully. Creepers is action-packed, but throws together a slew of historical references, a hint of romance, and mind-numbing terror that nicely blend together for a truly unique and gratifying reading experience.